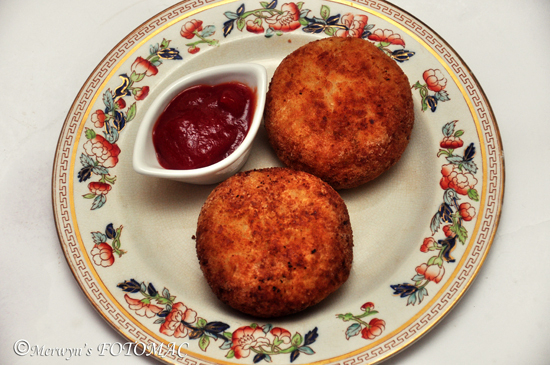 Potato Chops are a perfect snack or an appetizer served especially at Goan parties, weddings, traditional & festive occasions. The filling in potato chops is usually Beef Mince but you may use chicken, lamb, soya mince or even mixed vegetable filling. It is an authentic part of Goan cuisine & a must have at Christmas, New Year & Easter. It is a tasty finger food & great as a dry lunch too. ½ tsp. Red Chilli pwd. A pinch each of Nutmeg & green Cardamom pwd. Heat 4 tbsps. of oil in a kadhai/wok/ pan till hot. Saute the onions till soft & translucent over med. heat. Add garlic & ginger & saute till rawness disappears. Add all the dry spice powders, sugar, tomatoes & saute till tomatoes are soft. Add the mince, stir & cover & cook on a low heat for about 25 mins. or until the mince is well cooked. Add nutmeg & cardamom powder. Stir occasionally & sprinkle some water if the mince is turning dry quickly or add a little more oil. Add vinegar & adjust salt to taste. The mince should be a dry filling. Sprinkle chopped coriander, mix well & keep aside to cool. Meanwhile, wash potatoes well & boil them in their jackets in a pressure cooker till soft & tender. (Do not over cook or the potatoes will get mashed & soggy). Peel & mash the potatoes when they are moderately hot & comfortable to the touch. (Do not cool them completely or the mash may not be smooth but lumpy). Take a handful of potato mash & place it in the palm of your hand & form a ball. Create a hollow/depression & fill in a teaspoon of the prepared mince. 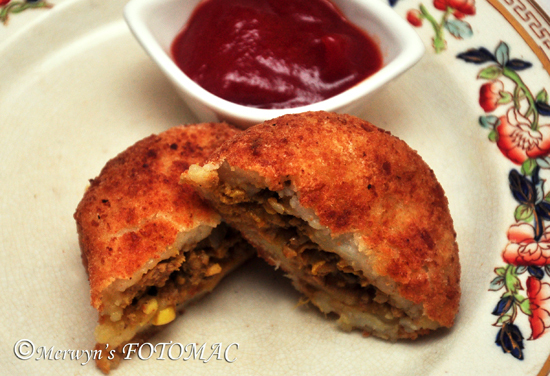 Cover it with the mash to form a smooth, well shaped round cutlet. Flatten slightly & make sure that the potato chop does not ooze out the filling. Prepare all the mince potato chops in this way & place on a tray. First lightly & evenly dip & coat each potato chop in the above prepared egg mixture & drain to remove excess. Roll in the prepared bread crumbs mixture & again place on a tray. Prepare all the potato chops in this way. Place the tray in the fridge for about 20 mins to set. Either pan fry or deep fry till lightly golden on all sides. Transfer to a plate lined with absorbent tissue. Serve hot with your favorite dipping sauce or chutney. Tried this today and it turned out awesome!!! Thanks for this recipe. Hi Hilda, the patatoe came out so good. Everyone really enjoyed & i was very happy listening to their praises 🙂 thankyou very much.. Im regularly following your receipes.. Keep posting. All the best. Thanks Hilda! loads of help. Potato chops today its is!.